If you happen to be a “Big Easy” local, or are just visiting, you may want to check out our DiggersList pick of the day: an antique Singer treadle sewing machine base, listed for just $50 by the Preservation Salvage Store. At first glance, it doesn’t look like much. After all, it’s only a base to a sewing machine table. Well, as the following designers and DIYers demonstrate, with a bit of repurposing panache, dusty, a rusted old piece of metal (and some moving parts) can be transformed into something fabulous and new. Also, developing a keen and creative design sensibility can surely prove that beauty is in the eye of the beholder…or is it, in this case…needle? After a good wire brush scrubbing and painting the base a modern black (sans the gold detailing ode to Singer), a beautiful frosted glass table is mounted on top for a very unique, updated finish. With vintage wood crates all the rage these days, it only makes sense these two items would make such a lovely pairing. The dark green paint of the sewing machine base complements the foliage of the colorful flowers and makes a fantastic and whimsical feature to any outdoor space. 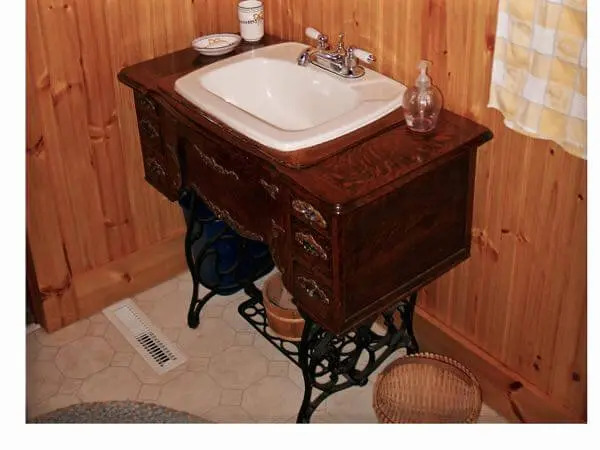 Instead of the usual, try something fun like this Singer sink. Hand-crafted with wooden vanity, copper front and drop-in sink, the surprise element is quite apparent and will definitely delight guests. Note: I’d even stack a bunch of towels on the foot petal to show off its storage potential. Look at what Tom Dewey, from Bloomington, Minnesota and one of our skilled and creative HomeJelly readers, did with his vintage sewing machine! Oh, we’re so proud! I’ve had another machine in storage for years- a vintage White – which I just brought out this week to make a similar sink, just for the fun of it. The cabinet is in good shape except that it needs a good sanding and varnishing. I hope to find a small sink at Ikea that will fit the bill. Will give the finished sink to a friend or family member, yet to be determined. I’ll send along a photo when the job is done. Thanks so much, Tom! We look forward to seeing the white one soon! Have any other repurposing ideas for a sewing machine base?